Cemetery/Memorial: P. I. E. 2B of the St. Sever Cemetery Extension, Rouen, France. also commemorated on the above in St. Andrews Eastern Cemetery. 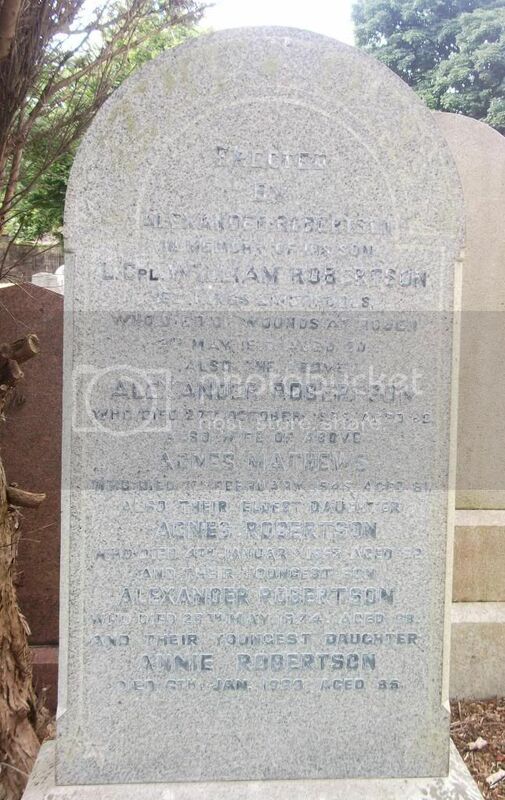 Additional Information: Son of Alexander and Agnes Robertson of 15 Marine Place, St. Andrews, Fife. Regiment/Service: Fife and Forfar Yeomanry. Cemetery/Memorial: Panel 20 of the Helles Memorial Turkey. Also commemorated on the above in St. Andrews Eastern Cemetery. 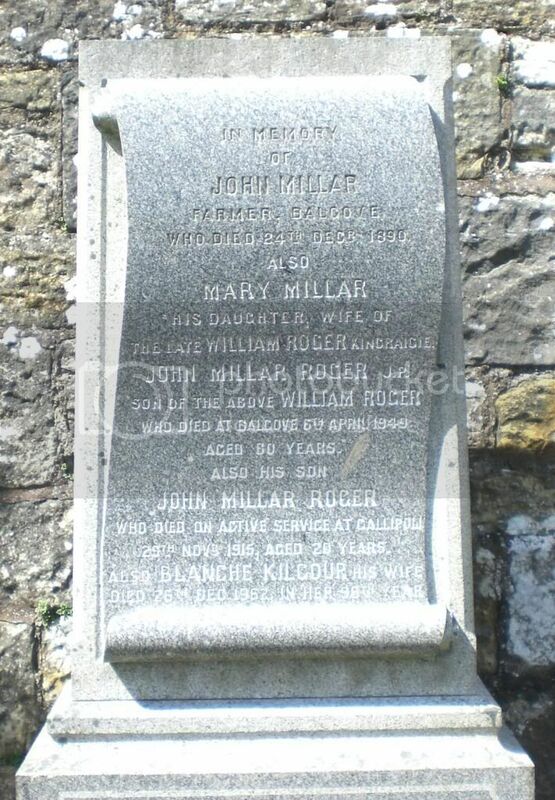 Additional Information: Son of John Millar Roger and Blanche Roger of Balgove, St. Andrews, Fife. Regiment/Service: 7th Bn. Border Regiment. Cemetery/Memorial: IX. J. 6 of the Dantzig Alley British Cemetery, Mametz. France. Also commemorated on the above in St. Andrews Eastern Cemetery. 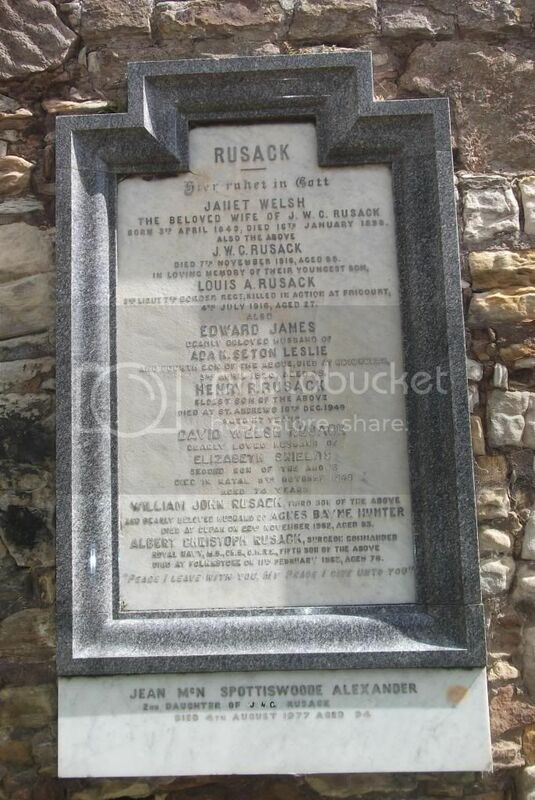 Additional Information: Son of William J. and Janet Welsh Rusack of St. Andrews, Fife. Regiment/Service: 11th Bn. Argyll and Sutherland Highlanders. Cemetery/Memorial: XI. J. 5. Flatiron Copse Cemetery, Mametz, France. Also commemorated on the above in St. Andrews Eastern Cemetery. 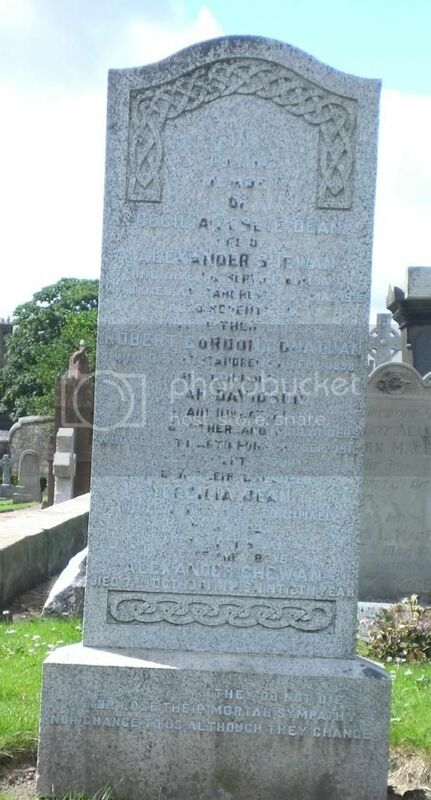 Additional Information: Son of Alexander Shewan (H.M. Indian Civil Service) and Cecilia Leslie Dean Shewan, of Seagate, St. Andrews, Fife. Born at St. Andrews, Fife. Cemetery/Memorial: 4. A. 6 of the Dar Es Salaam War Cemetery, Tanzania. Also commemorated on the above in St. Andrews Eastern Cemetery. 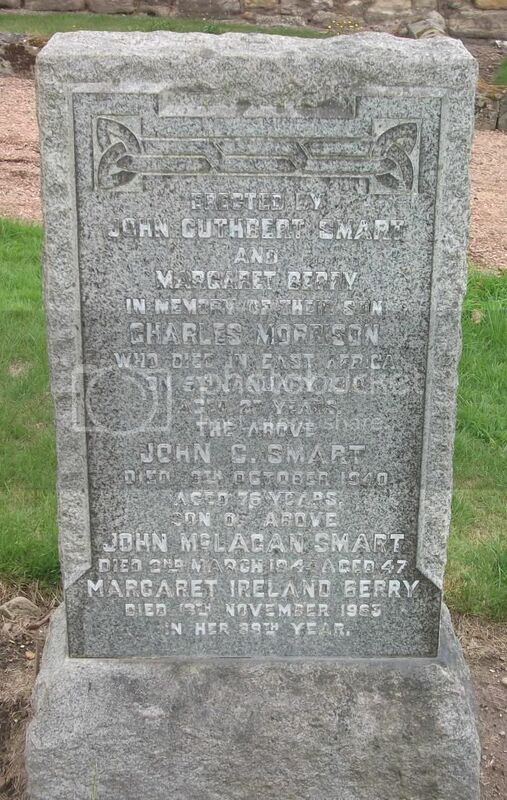 Additional Information: Son of John and Margaret (Berry) Smart. Regiment/Service: 13th Bn. Australian Infantry, A.I.F. Cemetery/Memorial: G 36 of the Bernafay Wood British Cemetery, Montauban. Also commemorated on the above in St. Andrews Eastern Cemetery. 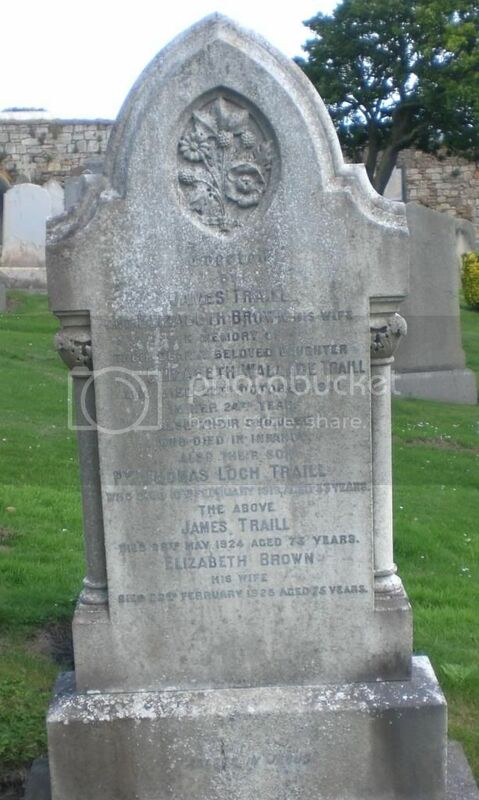 Additional Information: Son of James and Bella Smith of Holding 15, Troustrie, Crail, Fife, Scotland. Born St. Andrews, Fife. Regiment/Service: 11th Bn. Royal Scots. Cemetery/Memorial: B. 1 of the Hinges Military Cemetery, France. Also commemorated on the above in St. Andrews Eastern Cemetery. 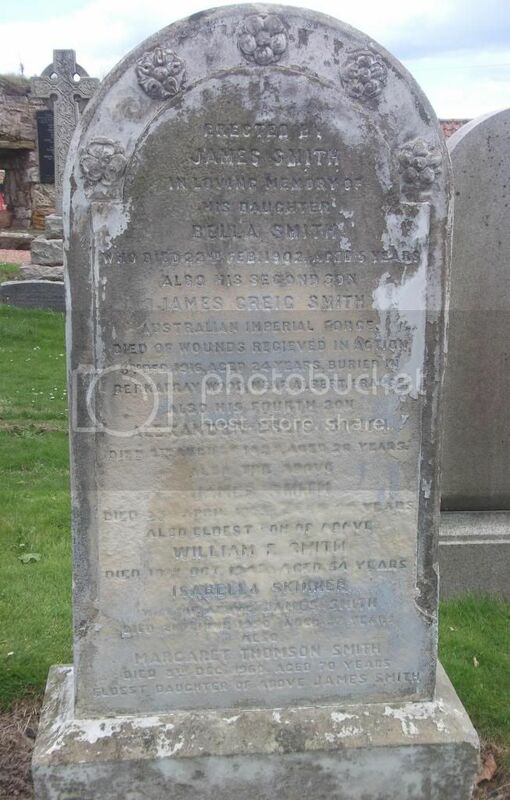 Additional Information: Son of William and Isabella Seath Mair Smith, of 14 Greenhill Place, Edinburgh. Regiment/Service: 144 Sqdn. Royal Air Force Volunteer Reserve. Cemetery/Memorial: Panel 203 of the Runnymede Memorial. Also commemorated on the above in St. Andrews Eastern Cemetery. 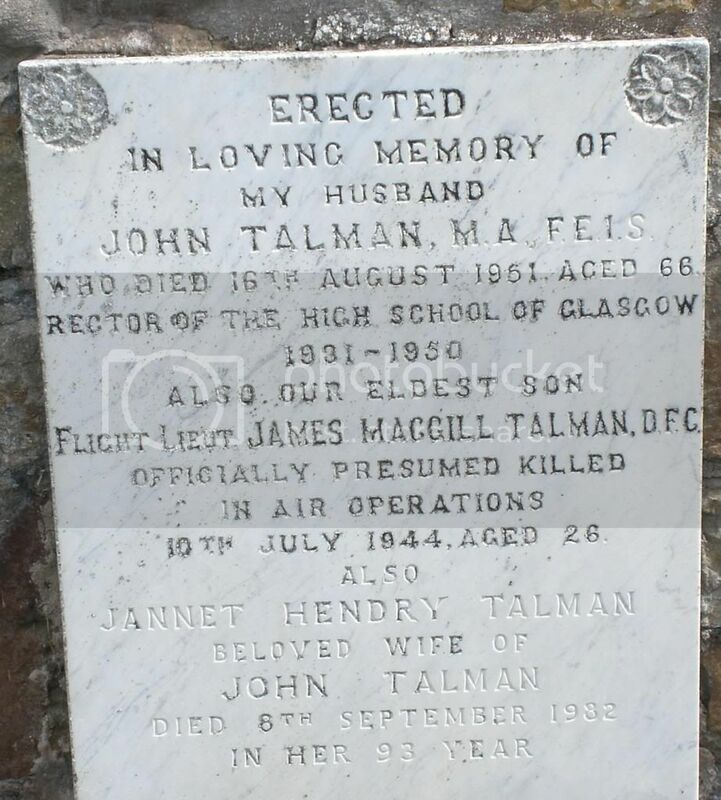 Additional Information: Son of John Talman and of Janet H. Talman (nee Sword); Husband of Vera Esther Talman, of Bearsden, Dunbartonshire. Additional Info. Thomas immigrated to the States in 1909. He enlisted in the US Army in 1917, the same year he married Annie Curry. He died in an Army hospital in New York in 1919 of pneumonia. Cemetery/Memorial: Arras Memorial. 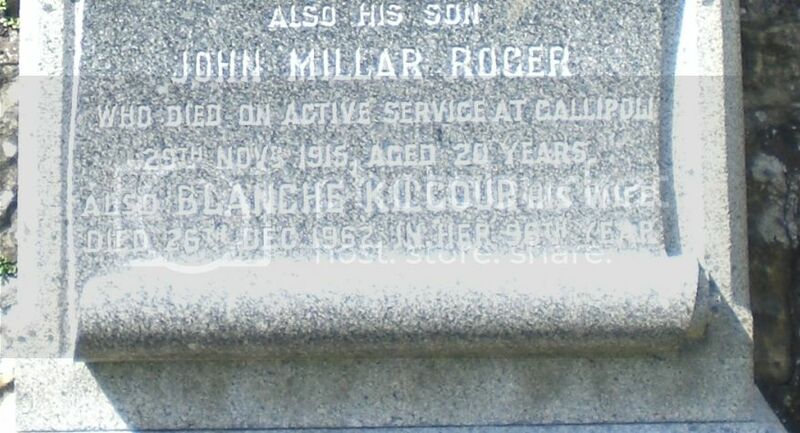 Also commemorated on the above in St. Andrews Eastern Cemetery. Headstone gives Date of Death for James as 21st March 1918, CWGC gives 27th March 1918. Additional Info. 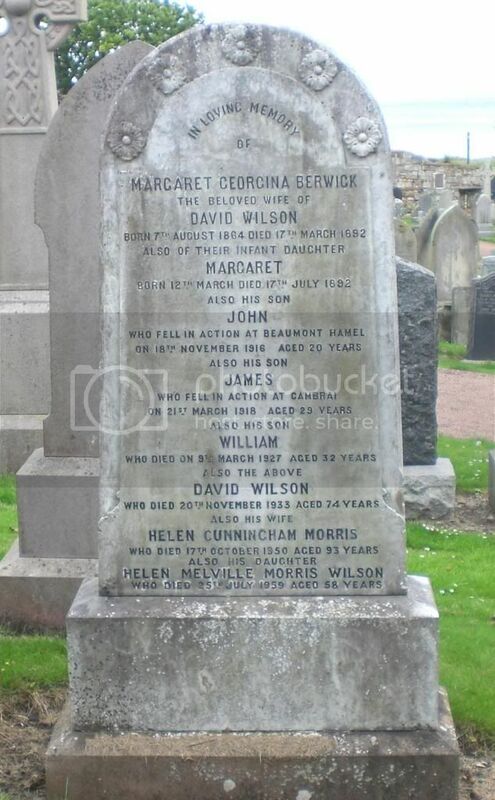 Son of Mr and Mrs David Wilson of Swan Avenue, Kennoway, Fife. 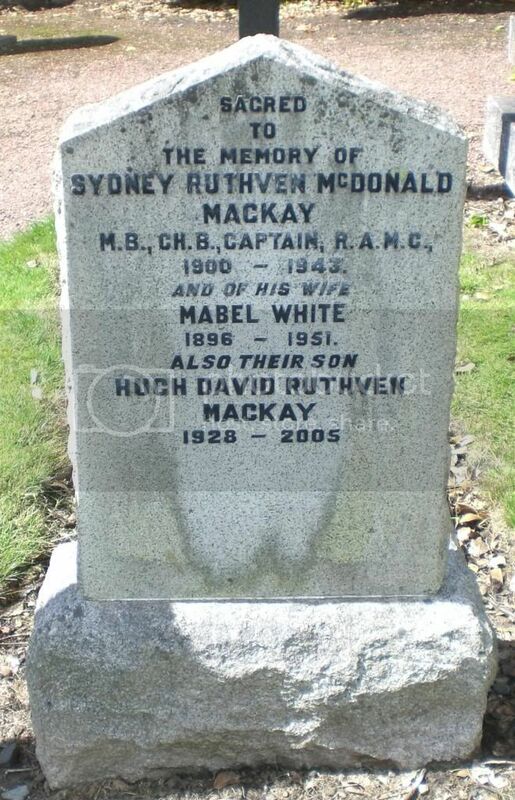 Also commemorated on family headstone in St Andrews Eastern Cemetery, Fife. Cemetery/Memorial: V. F. 25 of the Pont-Du-Hem Military Cemetery, La Gorgue. France. Also commemorated on the above in St. Andrews Eastern Cemetery. 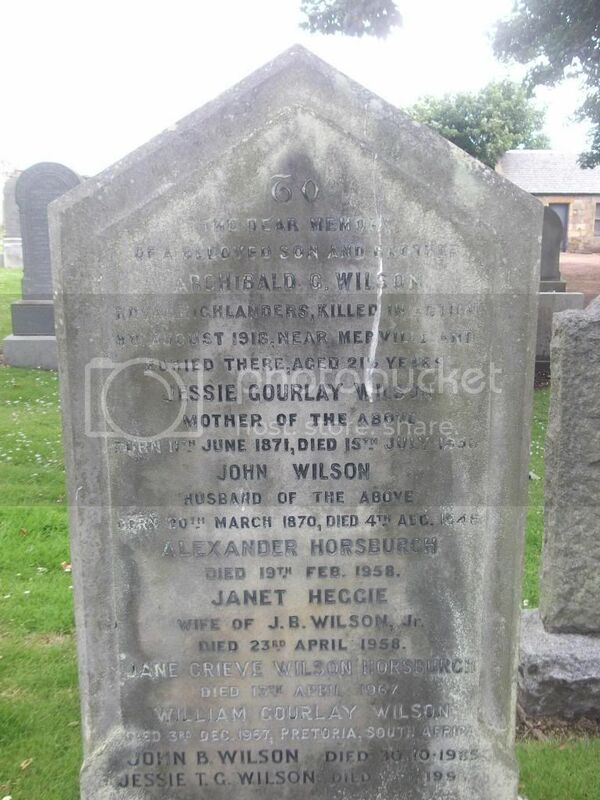 Additional Information: Son of John and Jessie Wilson of 81North Street, St. Andrews, Fife. Regiment/Service: 2nd/7th Bn. Attd. 1st/6th Bn. Lancashire Fusiliers. Cemetery/Memorial: Panel 32 to 34 of the Pozieres Memorial, France. Also commemorated on the above in St. Andrews Eastern Cemetery. Additional Information: Also served at the Dardanelles, and in Egypt. 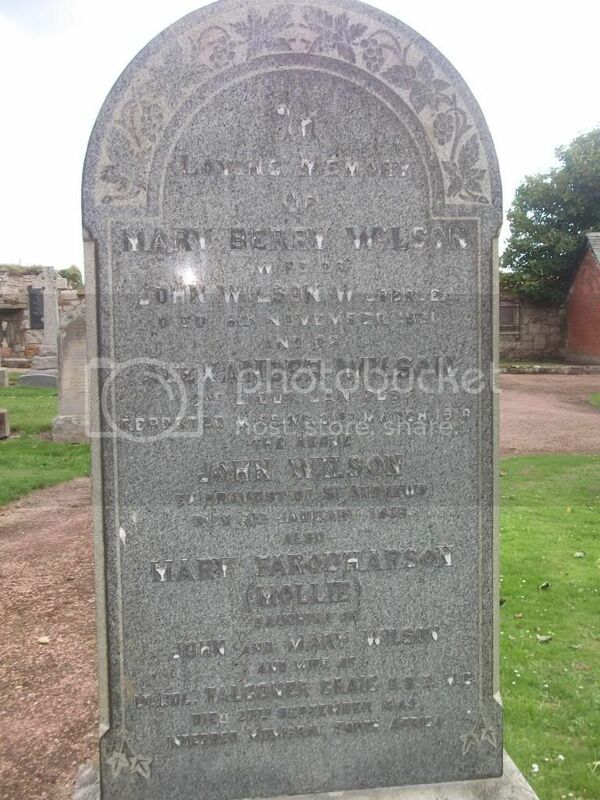 Son of John and Mary Wilson of Wilberlea, St. Andrews, Fife. Cemetery/Memorial: St. Andrews Eastern Cemetery.